Insights in Immunology is a peer reviewed, open access journal dedicated to publishing research on all aspects of Immunology. This journal aims to keep immunologists, physicians and immunology researchers up to date by publishing clinical & evidence based research. This Journal leads the specialty in promotion of original research by providing immediate open access to all articles after publication. allergy and other hypersensitivities, antigen recognition and responses, autoimmunity, clinical and human immunology, immune regulation, immune system development, immunogenetics, immunotherapy and vaccines, infectious disease and host response, innate immunity and inflammation, molecular and structural immunology, mucosal immunology, systems immunology, transplantation, tumor immunology. 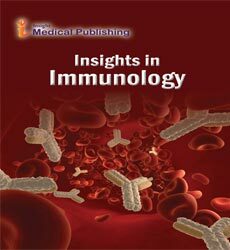 Insights in Immunology accepts manuscripts in the form of original research articles, review articles, case reports, short communications, letters to editor and editorials for publication in an open access platform. The journal uses editorial manager system for maintaining quality of the whole process of manuscript submission, peer review and tracking. Acquired (adaptive or specific) immunity is not present at birth. It is learned. As a person’s immune system encounters foreign substances (antigens), the components of acquired immunity learn the best way to attack each antigen and begin to develop a memory for that antigen. Acquired immunity is also called specific immunity because it tailors its attack to a specific antigen previously encountered. Its hallmarks are its ability to learn, adapt, and remember. Innate immunity refers to nonspecific defense mechanisms that come into play immediately or within hours of an antigen's appearance in the body. These mechanisms include physical barriers such as skin, chemicals in the blood, and immune system cells that attack foreign cells in the body. The innate immune response is activated by chemical properties of the antigen. Immunotherapy is treatment that uses certain parts of a person’s immune system to fight diseases such as cancer. This can be done in a couple of ways like stimulating your own immune system to work harder or smarter to attack cancer cells and giving your immune system components, such as man-made immune system proteins. Some types of immunotherapy are also sometimes called biologic therapy or biotherapy. Immune activation is considered today as the driving force of CD4+ T-cell depletion and acquired immunodeficiency syndrome (AIDS). A residual chronic immune activation persists in the case of infection with the extent of this residual immune activation being associated with CD4+ T-cell loss. A healthy immune response is key to good health, but ongoing immune activation and inflammation due to a persistent threat such as chronic HIV infection can lead to many different problems throughout the body. The host response is the defense mechanism of the host against exogenous microorganisms. Bacteria trigger inflammatory host responses which, along with the direct destructive effects of the bacteria, cause most of the tissue destruction. The role of mediators including the matrix metalloproteinases, proteoglycans, the kinins and anaphylatoxins, and low molecular weight mediators including products of arachidonic metabolism are important in host response. Signal transduction (also known as cell signaling) is the transmission of molecular signals from a cell's exterior to its interior. Signals received by cells must be transmitted effectively into the cell to ensure an appropriate response. This step is initiated by cell-surface receptors. Transmission is continued either by a series of biochemical changes within the cell or by modification of the cell membrane potential by the movement of ions in or out of the cell. Receptors that initiate biochemical changes can do so either directly via intrinsic enzymatic activities within the receptor or by activating intracellular messenger molecules.